"What is in a name?" No, we aren't in a production of Romeo + Juliet, but the name starts it all. TRAVELDASHERY. The name sounds ridiculous. It’s intriguing, it’s catchy, it’s fun to say. Go ahead,...try it, I can wait. Sounds familiar, because that’s pretty much what I was going to be selling. I also knew I wanted this re-brand to be completely travel focused. Add travel to haberdashery, and you’ve made up a fun new word. It was perfect! Once I thought more about it, I couldn’t get it out of my head for months! That’s how I knew at least the name of this brand new direction. The process in making this logo totaled probably around 6-8 months. I would spend hours on Pinterest, searching travel related designs to give me inspiration, sketching ideas, researching vintage advertisements, then sketching some more. Nothing I did was calling to me. I decided I needed a good ole fashioned brainstorming session. I reached out to my friend Erin, because you need at least two brains to storm. At this point the traveldashery was still just a glimmer in my eye, and we hadn’t yet decided to embark on this journey together; but this was the night the sparks started to ignite. Erin has a background in marketing, so I knew she would be a great person to bounce ideas off of and would get some of the design-ey lingo I was throwing her way. We started casually talking about how we would both love to just travel around the country, living out of an airstream and documenting our trips. That’s when everything clicked. This organic conversation manifested itself into what our brand is today. Not only does it cross the lines of being vintage and modern, the airstream came back in a major way, and it gives us feelings of nostalgia, creating memories, and focusing on what we find important in life. We want our brand to also portray what we choose to focus on: family, friends, traveling, and creating memories. Finally, I had the fuel I needed to seriously jump-start the traveldashery brand. The logo mark ended up coming to me pretty easily after that. My design style is very clean and simple, which, I believe, makes the best logo. I knew a simple outline was definitely the way to go, but I also wanted to add some type of design element that I could use throughout the rest of my branding. While researching old images of RVs and Airstreams for inspiration, some of them had painted designs on the side in fun color blocks, and my mind went to adding some line elements. Not only do they give it more of a retro feel, but they are simple and give the sense that the logo itself is in motion; which is what we're all about at the traveldashery, living a life in motion. The line element would also be something that could easily be replicated and added in other elements of our branding. At this point I could really start to visualize the branding across multiple mediums (which is always a challenge with branding). The lettering for me was the hardest part of the logo. I just went through a huge modern calligraphy phase and that was my first instinct. To be honest, though, I feel like the style is a little overused in branding these days, and I needed to stand out from what everyone else was doing. I do love me some good hand lettering, but felt that style also wouldn’t fit with what I wanted the brand to represent. It needed to feel retro, but also embody that simple-ness that I love. I spent hours pouring over FontBook and Pinterest to see if something caught my eye and could spark some needed inspiration. As helpful as those platforms are, the overabundance of options can also hinder the design process. So, I put my pencil down for a couple of weeks and let my design brain rest. When I came back to my initial sketches, this simple sans serif design jumped right off the page at me. I showed my sketches to Erin and surprisingly, she chose the exact same one I liked as her favorite! I re-worked the lettering, added some details to give it a little bit of a retro feel, and the logo was created. To designers out there who ever feel trapped during your design process, remember it is okay to walk away and let your ideas rest, marinate, and form. Now time for my favorite part of the branding process, picking the color palette! 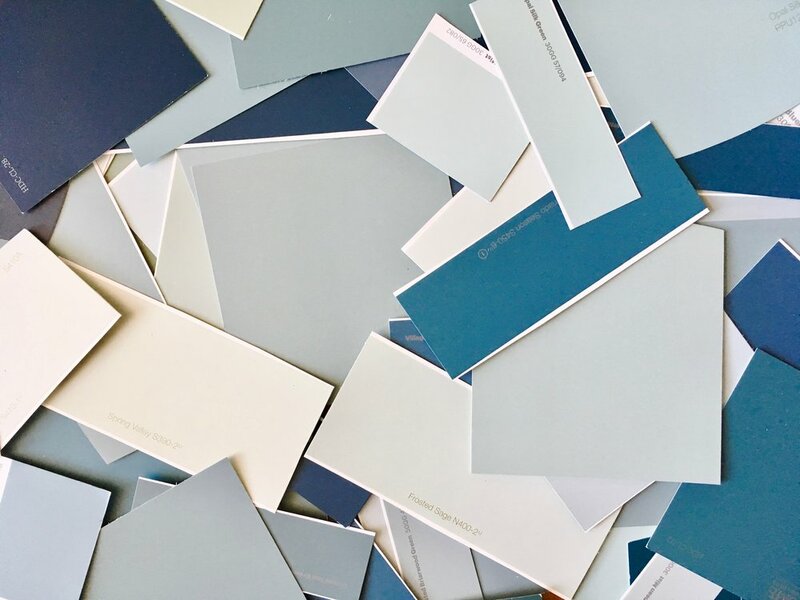 I don’t have a fancy Pantone color guide (#lifegoals), so I went to the ole hardware store and grabbed paint swatches so I could visually see which color combos looked best. Previously, we had settled on a vintage theme of a dark navy or maybe a turquoise with a lighter blue or light sage. Let me tell you, I thought I would go in and grab like maybe ten swatches and call it a day, but I definitely walked out with closer to 50 (sorry Home Depot). We threw them all down on a big table, started sorting, and put aside the ones we loved. I then took our top picks and found their digital equivalents. I had to tweak the colors just a bit once I started dropping them into designs, and I’m thrilled with where we ended up. Building a brand design from scratch can be quite the process, but a rewarding one, for sure. It took a long time, and a lot of trial and error, but we are very happy with the results. Now that it is complete, we are thrilled to be able to start this journey!